Norepinephrine (NE) has long been implicated in both the pathogenesis of major depression and in the mechanism of action of antidepressant medications (Schildkraut, 1965; Frazer, 2000). This is largely because many of the first-generation antidepressants, the tricyclics, increase synaptic concentrations of NE. Also, early studies showed that depletion of monoamines with reserpine leads to depressogenic effects in individuals already vulnerable to affective illness (Goodwin and Bunney, 1971). More recently, Miller et al. (1996) examined the ability of α-methyl-p-tyrosine (AMPT), through rapid catecholamine depletion, to cause a relapse of depression in those currently treated with a NE reuptake inhibitor. The researchers observed that AMPT had very little effect on mood in normal subjects but, when given to depressed patients in remission, AMPT produced a return of depressive symptoms (Charney, 1998). The generation of mice with a targeted disruption of the gene for dopamine β-hydroxylase (Dbh) (Thomas et al., 1995), the final enzymatic step in NE formation, has enabled researchers with a new model to examine the role of this monoamine in complex physiological and behavioral functions (Thomas and Palmiter, 1997a,b). This strategy is a distinct advantage over enzyme inhibition and chemical lesion techniques where up to 30% of NE levels can remain (Serova and Naumenko, 1996; Lucki et al., 2000), making interpretation of behavioral and neurochemical effects more difficult (Abercrombie and Zigmond, 1989; Hughes and Stanford, 1998). The genetic approach is also potentially more specific in that AMPT also blocks dopamine synthesis in addition to NE synthesis, reserpine depletes all monoamines, and chemical lesions ablate adrenergic cotransmitters as well as NE. Furthermore, many previous studies investigating the role of NE in behavioral and neurochemical responses use the selective noradrenergic neurotoxinN-(2-chloroethyl)-N-2-bromobenzylamine (DSP-4) (Berridge and Dunn, 1990; Lapiz et al., 2000), which preferentially lesions neurons of the dorsal noradrenergic bundle originating from the nucleus locus coeruleus, leaving the ventral noradrenergic bundle neurons relatively spared (Fritschy and Grzanna, 1991). Recent studies have shown that ventral bundle noradrenergic projections, but not DSP-4-sensitive pathways, may mediate the antidepressant-like effects of reboxetine in the rat forced swim test (FST) (Lucki et al., 2000). Mice that lack endogenous NE have another benefit in that NE can be replaced transiently by administration ofl-threo-3,4-dihydroxyphenylserine (DOPS), a synthetic precursor of NE that is metabolized byl-aromatic amino acid decarboxylase into NE, thus bypassing the requirement of dopamine β-hydroxylase (Thomas et al., 1998). Behavioral, neurochemical, and physiological phenotypes can be reversed by acute DOPS administration (Thomas et al., 1995, 1998;Thomas and Palmiter, 1997a,b). Thus, the Dbh−/− mice offer a potentially more complete, more specific, and readily reversible model for examining the role of adrenergic signaling in the mechanism of antidepressant action. For these reasons we decided to testDbh−/− and littermate control mice in a well characterized test sensitive to antidepressant-like drug activity in the mouse, the FST (Porsolt et al., 1977; Dalvi and Lucki, 1999). The mouse FST involves placing the animals in an inescapable cylinder of water. Following initial periods of escape-oriented behavior, the animals demonstrate behavioral immobility or passive floating, which is thought to reflect either the failure to persist in active behavior after persistent stress, or the development of passive behavior that disengages the animal from active forms of coping with stressful stimuli (Lucki, 1997). Antidepressants from many classes decrease the length of time spent immobile (Porsolt et al., 1977; Borsini and Meli, 1988). In this study, antidepressants from several classes thought to have varying degrees of specificity for the adrenergic system were first tested in the FST in Dbh−/− and littermate control mice. These drugs included the selective NE reuptake inhibitors desipramine and reboxetine, the atypical antidepressant bupropion, and the monoamine oxidase (MAO) inhibitor pargyline. Second, the repletion of NE in the Dbh−/− mice was examined for its ability to restore antidepressant efficacy. Third, behavioral changes in the FST in the absence of drug treatment were measured to determine the impact of the chronic loss of adrenergic signaling. Finally, NE transporter levels and MAO activity were measured in Dbh−/− and littermate control mice to determine the integrity of the primary targets of most of the antidepressants tested, and whether alterations in these measures, as opposed to a lack of endogenous NE, could account for the altered efficacy of the antidepressants in the FST. Mice were derived from a hybrid line (129/SvCPJ and C57BL/6J). Dbh−/− and littermate control (Dbh+/−) mice were bred as described previously (Thomas and Palmiter, 1997a). Mice were maintained on a 12-h light/dark cycle (lights on 6:00 AM-6:00 PM) in a specific pathogen-free facility at the University of Pennsylvania, Philadelphia, PA. Food and water were available ad libitum, and animals were maintained according to the guidelines outlined in the National Institutes of Health Guide for Care and Use of Laboratory Animals. All experimental procedures were carried out in accordance with protocols approved by the University of Pennsylvania Institutional Animal Care and Use Committee. Genotype was deduced from phenotype (Dbh−/− mice exhibit delayed growth during adolescence and bilateral ptosis), and a subset of mice was confirmed by polymerase chain reaction (Thomas et al., 1995).Dbh+/− mice were used as controls in all experiments because they are indistinguishable from wild-type (Dbh+/+) mice with respect to NE and epinephrine levels (Thomas et al., 1998) as well as behaviorally (Thomas and Palmiter, 1997b). Adult (3–7 months) male and female littermates of each genotype were evenly distributed to experimental and control groups for each treatment. All behavioral sessions were conducted between 12:00 PM and 7:00 PM. Animals were randomly assigned to treatment conditions and tested in counterbalanced order. Mice were placed individually into Plexiglas cylinders (46 cm in height × 21 cm in internal diameter) filled with water (23–25°C) to a depth of 15 cm. This depth was sufficient to keep the mice from supporting themselves by placing their paws or tails on the base of the cylinder. All drugs were administered intraperitoneally 30 min prior to testing. Pargyline was also injected 24 h prior to testing to enhance MAO inhibition. While the FST procedure was essentially similar to that described by Porsolt et al. (1977), a cylinder of larger diameter was used because this has been reported to increase the predictive validity of the mouse FST (Sunal et al., 1994). A 6-min test duration was used (cf., Borsini and Meli, 1988). The water was changed between subjects. All test sessions were recorded by a video camera positioned directly above the cylinders. Videotapes were subsequently scored blind by a trained observer. The behavioral measure scored from videotape was the duration of immobility during the last 4 min of the test period. A mouse was judged to be immobile when making only those movements necessary to keep its head above water. Measurement of NE Transporter Levels. NE transporter levels were determined in various brain regions ofDbh+/− andDbh−/− mice by measuring immunoreactivity to a specific antibody. Animals were killed by decapitation. Brains were rapidly removed and separated into eight subregions: olfactory bulbs, frontal and occipital areas of cerebral cortex, cerebellum, rostral and caudal halves of the brainstem, rostral spinal cord, and remaining subcortical structures. The tissue was placed in ice-cold RIPA buffer (10 mM Tris, pH 7.4, 150 mM NaCl, 1 mM EDTA, 0.1% SDS, 1% Triton X-100, 1% Na-deoxycholate) containing a protease inhibitor cocktail (Sigma, St. Louis, MO), and homogenized using a motor-driven homogenizer. The homogenate was centrifuged at 20,000g for 40 min at 4°C. The protein content of homogenates was determined using the DC protein assay kit (Bio-Rad, Hercules, CA) and bovine serum album to obtain the standard curve. Sample buffer containing 10% β-mercaptoethanol was added to the homogenate, which was then stored at −80°C until use. Samples containing 70 μg of protein per well were electrophoresed through a 10% acrylamide gel with prestained protein markers according to Laemmli's method. The gels were soaked in transfer buffer (25 mM Tris, 192 mM glycine, 20% methanol) for 10 min and then transferred to nitrocellulose membrane (Hybond-C; Amersham Pharmacia Biotech, Piscataway, NJ) for 1 to 2 h at a constant current of ∼250 mA using a semidry electrophoretic blotter (CBS Scientific, Del Mar, CA). To assess protein loading and transfer quality, protein bands were stained using 0.1% Ponceau S solution (Sigma). All subsequent procedures were performed at room temperature. The blots were blocked in TPBS (0.1% Triton X-100, 0.1 M NaHPO4, pH 7.4, 150 mM NaCl) with 5% nonfat dry milk after destaining with TPBS. All washes and antibody incubations were performed in TPBS. The blots were incubated with NE transporter (NET) polyclonal antibody (1:1500) (Schroeter et al., 2000) overnight, and probed with a secondary antibody conjugated to horseradish peroxidase (Amersham Pharmacia Biotech) at 1:5000 dilution in blocking solution for 1 to 2 h using the enhanced chemiluminescence system (Amersham Pharmacia Biotech). Blots were then apposed to Biomax MR film (Kodak, St. Louis, MO) for 5 min. The amount of protein in the most heavily labeled band (just below 80 kDa) was estimated by densitometry using Kodak image analysis software (Kodak Digital Science ID, New Haven, CT). MAO activity was compared between Dbh+/− andDbh−/− mice using a method modified from one used previously in mice (Wu et al., 1993; Cases et al., 1995). Animals were killed by decapitation. Brains were rapidly removed and separated into four subregions: olfactory bulbs, frontal cortex, cerebellum, and hippocampus. Approximately 30 mg of each region was homogenized in 0.5 ml of ice-cold 50 mM NaHPO4 buffer, pH 7.4, and stored at −80°C until assayed. For each sample, three conditions were done in duplicate. For each condition, 50-μl aliquots of the samples were preincubated for 10 min at room temperature with 10 μl of water, deprenyl (100 μM), or pargyline (10 mM). Each aliquot was then added to 0.94 ml of the assay buffer to give final concentrations of 50 mM NaHPO4, pH 7.4, and 100 μM serotonin (of which 2% was 2-[14C]serotonin; Amersham Pharmacia Biotech). When present, the final concentrations of deprenyl and pargyline were 1 and 100 μM, respectively. The samples were incubated for 20 min at 37°C and then extracted with 6 ml of ethyl acetate/benzene (1:1). Samples were shaken for 30 s and then centrifuged for 10 min at 2000 rpm to separate the phases. The organic phase (4 ml) was added to 5 ml of scintillation fluid and assayed using liquid scintillation spectrometry. Total MAO activity was determined by subtracting the mean value for the sample treated with pargyline from that treated with water. MAOA activity was determined by subtracting the mean value for the sample treated with deprenyl from that treated with water. MAOB activity was determined by subtracting MAOA activity from total MAO activity. All drugs were freshly prepared prior to use and injected intraperitoneally using a volume of 10 μl/g. Desipramine hydrochloride (Sigma), reboxetine hydrobromide (Pharmacia and UpJohn, Kalamazoo, MI), pargyline hydrochloride (Sigma), and bupropion hydrochloride (Sigma/RBI, Natick, MA) were dissolved in deionized H2O and sonicated mildly. All drug doses were calculated as the base weight. DOPS (Sumitomo Pharmaceuticals, Osaka, Japan) was administered as previously described (Thomas et al., 1998). Briefly, DOPS (1 g/kg) was dissolved at 20 mg/ml in 0.2 M HCl containing 2 mg/ml ascorbic acid. The solution was neutralized with 10 M NaOH just before subcutaneous injection, which was given 4 to 6 h prior to behavioral testing. A two-way analysis of variance (ANOVA), with drug treatment and genotype as factors, was carried out in studies examining the effects of various antidepressants on behavior in the FST. A three-way ANOVA was carried out on the data from the DOPS experiment using pretreatment with DOPS, drug treatment, and genotype as factors. A two-way ANOVA of protein levels (or enzyme activity) with brain region and genotype as factors was carried out in the biochemical studies examining antidepressant targets. Any factors that demonstrated overall significant differences were analyzed further using Fisher's post hoc tests. Effects of Desipramine and Reboxetine in FST. To determine whether NE contributes to baseline behavior in the FST, saline was injected into Dbh−/− and littermate control mice 30 min prior to being placed in the water. There was no difference between immobility scores inDbh+/− andDbh−/− mice given saline injections (Fig. 1). Animals from both genotypes behaved indistinguishably in terms of pattern of swimming behavior. Furthermore, there are no differences in spontaneous activity in the home cage between genotypes (S. A. Thomas, unpublished observations) that would mask a differential response to stress in the FST. To test whether the antidepressants and NE reuptake inhibitors desipramine and reboxetine would be without effect in the absence of NE, these drugs were administered to the mice 30 min prior to being tested in the FST. Desipramine dose dependently decreased immobility scores in the FST (Fig. 1). ANOVA revealed a significant effect of genotype [F(1,55) = 24.49, p < 0.01] and significant genotype × desipramine treatment interaction [F(2,55) = 4.92, p = 0.01]. There was no overall effect of treatment with desipramine [F(2,55) = 2.40, p = 0.10]. Post hoc analysis revealed that desipramine at both doses (5 and 20 mg/kg) reduced immobility in the Dbh+/−animals only, producing no behavioral effect in theDbh−/− animals. Figure2 shows the effects of reboxetine in the FST. ANOVA revealed a significant effect of genotype [F(1,50) = 18.17, p < 0.01] and genotype × reboxetine treatment interaction [F(2,50) = 8.83, p < 0.01], but there was no overall effect of treatment with reboxetine [F(2,50) = 0.82, p = 0.45]. Post hoc analysis revealed that reboxetine at both doses tested (5 and 20 mg/kg) reduced immobility in the Dbh+/−animals. In contrast, 5 mg/kg reboxetine was ineffective and the 20 mg/kg actually increased immobility in theDbh−/− animals. Effects of the tricyclic antidepressant desipramine on immobility scores in the mouse FST. 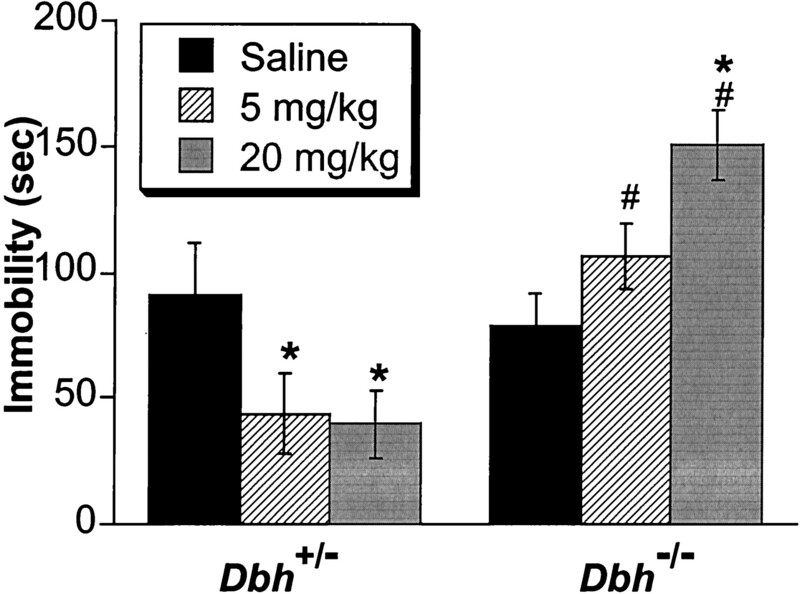 InDbh+/− animals desipramine (5 mg/kg,n = 12; 20 mg/kg, n = 11) decreased immobility compared with saline-treated animals (n = 9), whereas inDbh−/− animals desipramine (5 mg/kg,n = 12; 20 mg/kg, n = 9) failed to alter immobility scores compared with saline-treated animals (n = 8). There was no difference in immobility scores of saline-treated animals between genotype. All columns represent mean values with vertical lines indicating 1 S.E.M. ∗, groups that differed significantly from saline-treated animals;p < 0.05. #, groups that differed significantly from relevant genotype control; p < 0.05. Effects of the NE reuptake inhibitor reboxetine on immobility scores in the mouse FST. In theDbh+/− animals reboxetine (5 mg/kg,n = 8; 20 mg/kg, n = 10) decreased immobility scores compared with saline-treated animals (n = 10). In Dbh−/−animals reboxetine (5 mg/kg, n = 8) failed to alter immobility scores, whereas reboxetine (20 mg/kg, n= 10) actually increased immobility compared with saline-treated animals (n = 10). All columns represent mean values with vertical lines indicating 1 S.E.M. ∗, groups that differed significantly from saline-treated animals; p < 0.05. #, groups that differed significantly from relevant genotype control; p < 0.05. Effects of Atypical Antidepressant Bupropion and MAO Inhibitor Pargyline in FST. To examine the effects of antidepressants that can alter NE neurotransmission independent of direct effects at the NE transporter, the effects of the atypical antidepressant bupropion (20 mg/kg) and the MAO inhibitor pargyline (75 mg/kg × 2) were examined in the FST (Fig. 3). ANOVA revealed a significant effect of genotype [F(1,108) = 15.14, p < 0.01] and genotype × drug treatment interaction [F(2,108) = 4.96, p < 0.01], but there was no overall effect of antidepressant treatment [F(2,108) = 1.62,p = 0.20]. Post hoc analysis revealed that both bupropion and pargyline reduced immobility inDbh+/− animals only. In contrast, there was no effect of either compound inDbh−/− animals. Effects of the atypical antidepressant bupropion and the MAO inhibitor pargyline on behavior in the FST. 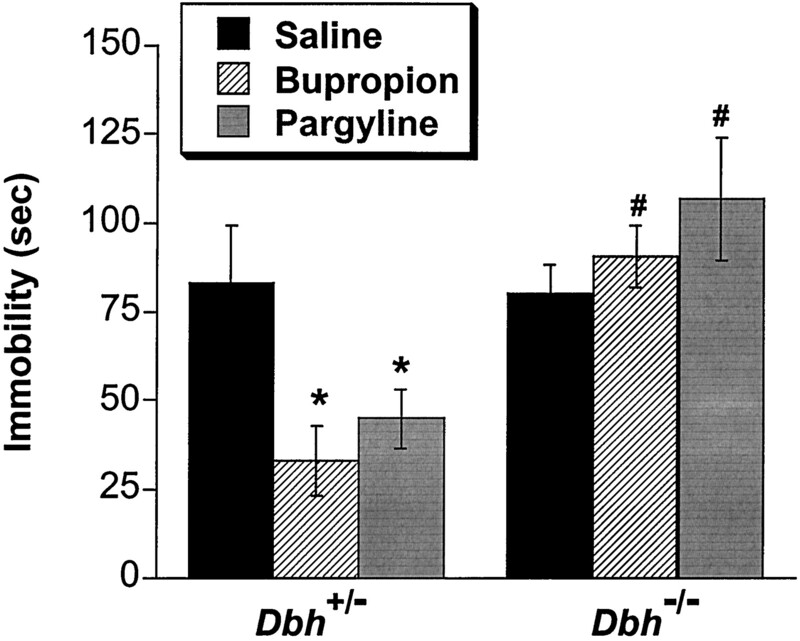 In theDbh+/− animals bupropion (20 mg/kg,n = 20) and pargyline (75 mg/kg,n = 19) decreased immobility compared with saline-treated animals (n = 20). InDbh−/− animals, both bupropion (20 mg/kg,n = 18) and pargyline (75 mg/kg × 2,n = 18) failed to alter immobility scores compared with saline-treated animals (n = 19). All columns represent mean values with vertical lines indicating 1 S.E.M. ∗, groups that differed significantly from saline-treated animals;p < 0.05. #, groups that differed significantly from relevant genotype control; p < 0.05. Effects of Disruption of Dbh on NE Transporter Levels and MAO Activity. Because the primary molecular targets for most if not all of the drugs tested in this study include either NET or MAO, it was of interest to determine whether changes in the expression or activity of these proteins occur in the absence of NE. This is because MAO is responsible for metabolizing dopamine and serotonin as well as NE, and because dopamine is a substrate for NET. Thus, behavioral effects of drugs targeting these proteins may be due to substrates other than NE. Some evidence has suggested that the expression of NET could be reduced or perhaps even eliminated in the absence of NE, possibly as a means of compensation (Lee et al., 1983; Cubells et al., 1995). Similar changes could potentially occur for MAO activity. To examine these possibilities, NET expression levels were quantitated in eight different brain regions by Western blot, and MAO activity was quantitated in four different brain regions by radioenzymatic assay. Furthermore, the type B-selective MAO inhibitor deprenyl was used to estimate regional activities of both MAOA and MAOB in the mice. No significant differences between genotype were observed in the regional expression of NET or the regional activity of MAOA or MAOB (Fig.4). NET levels and MAO activity in mice with and without NE. A, representative Western immunoblot using enhanced chemiluminescence. Samples marked with an “a” areDbh+/− and those marked with a “b” areDbh−/−. Numbers indicate brain region in the order shown in B. B, regional levels of NET expression. Band intensity is given in arbitrary densitometry units and is derived from the single major band detected by this antibody (indicated by NET in A). Brain regions were analyzed from six mice of each genotype. C and D, regional activity for the two subtypes of MAO as determined by radioenzymatic assay. Activity is given as two-thirds of total organically extracted radioactive product in cpm per milligram of protein. All columns represent mean values with vertical lines indicating 1 S.E.M. Effects of Pretreatment with DOPS on Effects of Desipramine in FST. To test whether the absence of antidepressant-like effects might be due to developmental alterations inDbh−/− mice, NE content was restored acutely with DOPS. The effect of DOPS on desipramine-induced behavioral changes in the FST is shown in Fig.5. ANOVA revealed significant effects for genotype [F(1,100) = 11.64, p < 0.01] and drug treatment [F(2,100) = 4.28,p < 0.04], a genotype × DOPS pretreatment interaction [F(1,100) = 8.8, p < 0.01], a significant genotype × drug treatment [F(1,100) = 13.71, p < 0.01], and an overall significant genotype × DOPS pretreatment × drug treatment interaction [F(2,100) = 5.86,p = 0.02]. There was no significant effect of pretreatment with DOPS [F(1,100) = 0.95,p > 0.3] or DOPS × drug treatment interaction [F(2,100) = 2.99, p = 0.087]. Post hoc analysis revealed that inDbh+/− animals pretreated with vehicle or DOPS, desipramine reduced immobility compared with the corresponding group treated with saline. In contrast, desipramine produced a significant increase of immobility scores in theDbh−/− animals pretreated with vehicle. In comparison to this group, the immobility scores in theDbh−/− animals pretreated with DOPS were significantly lower and were not statistically different fromDbh+/− animals pretreated with DOPS and then given desipramine. There was no difference in immobility between saline-treated animals that had been pretreated with DOPS compared with those that had been pretreated with vehicle. Effect of restoring NE using pretreatment with DOPS on desipramine-induced behavioral changes in the FST. 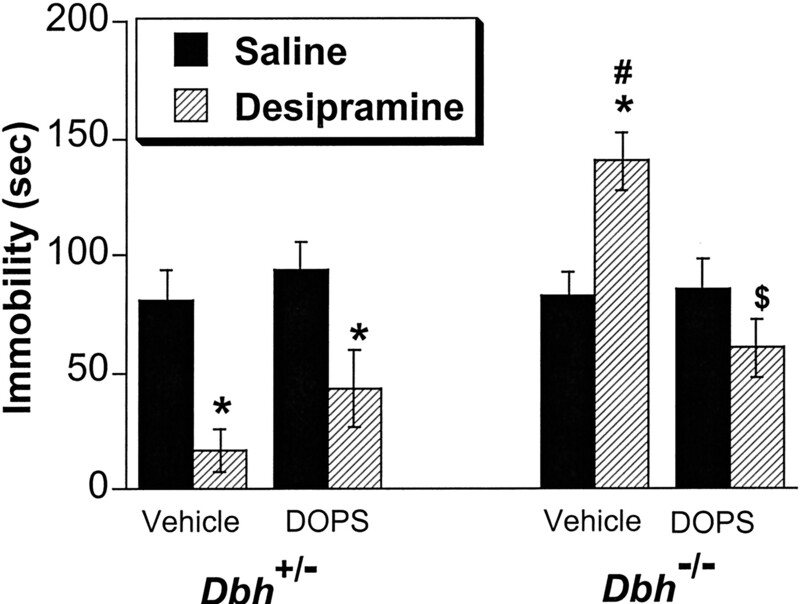 In theDbh+/− animals, desipramine (20 mg/kg) induced a significant decrease in immobility scores in animals pretreated with vehicle (n = 8) or DOPS compared with saline-treated animals (vehicle, n = 18; DOPS,n = 19]. In theDbh−/− animals, desipramine (20 mg/kg,n = 8) induced a significant increase in immobility scores in animals pretreated with vehicle compared with saline-treated animals (n = 19). In animals pretreated with DOPS, desipramine (20 mg/kg, n = 10) produced significantly lower immobility scores than the corresponding group of vehicle-pretreated animals given desipramine (n = 16). All columns represent mean values with vertical lines indicating 1 S.E.M. ∗, groups that differed significantly from relevant saline-treated animals; p < 0.05. #, groups that differed significantly from relevant genotype control;p < 0.05. $, groups that differed from relevant drug treated control (no DOPS); p < 0.05. Defining the role of various monoamines in complex behavioral responses requires tools that are both complete in action and specific in nature. Traditionally, the use of enzyme inhibitors that block the synthesis of monoamines, or chemical neurotoxins that selectively destroy monoamine nerve terminals have been the strategies most widely used. The burgeoning use of targeted gene disruption (knockout) techniques over the past decade has added a new and more precise tool to investigate the roles of monoamines in behavior. The present studies support the utility of using mice, which lack endogenous NE and epinephrine through targeted disruption of the Dbh gene, to study the role of NE in mediating antidepressant-sensitive behaviors. The lack of a difference in baseline behavior between mice with and without NE is perhaps surprising given the large body of evidence supporting the role of this amine in both the psychopathology of depression and in the integration of the stress response (Stanford, 1995; Valentino et al., 1998; Frazer 2000). This observation is supported by our finding that there was no difference in baseline immobility in a second test of antidepressant-like effects that is independent of swimming, the tail suspension test (J. F. Cryan, I. Lucki, and S. A. Thomas, unpublished observations). Furthermore, previous studies using various noradrenergic neurotoxins failed to show any difference in baseline performance in the rat (Lucki et al., 2000) and mouse (Redrobe et al., 1998; Semba and Takahashi, 1988) versions of the FST. It is also of interest that depletion of serotonin byp-chlorophenylalanine fails to alter baseline immobility in both the rat and mouse FST (Redrobe et al., 1998; Page et al., 1999). The lack of effect of both desipramine and reboxetine in theDbh−/− mice is consistent with the hypotheses that both compounds elicit their effects through increasing synaptic NE via selective blockade of the NE transporter (Wong et al., 2000). 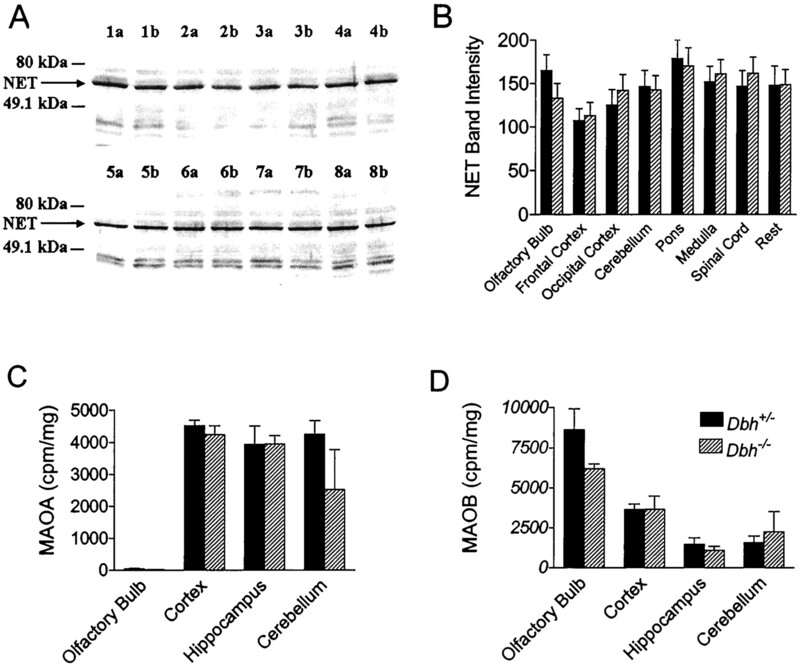 The lack of any difference in the expression levels of the NE transporter between Dbh−/− andDbh+/− mice further supports the premise that the inability of antidepressants to produce their behavioral effects in Dbh−/− mice is not due to a reduction in NE transporter but rather to a loss of the endogenous ligand itself. The mechanism of action of the antidepressant bupropion is not fully understood (Ascher et al., 1995). It may mediate its effects through potentiation of dopamine neurotransmission because it has a higher affinity for the dopamine transporter than either the NE or serotonin transporter (Nomikos et al., 1992). However, Cooper et al. (1994)demonstrated that bupropion and its metabolite 306U73 inhibit the firing of locus coeruleus noradrenergic neurons at doses much lower than that needed to inhibit dopamine cell firing. Biochemical studies suggest that chronic treatment with bupropion induces a down-regulation of postsynaptic β-adrenoceptors and desensitization of NE-stimulated adenylyl cyclase in rat cortex (Ascher et al., 1995). Clinical studies indicate that bupropion enhances noradrenergic functional activity as reflected by an increased excretion of the hydroxy metabolite of melatonin, while concurrently producing a decrease in NE turnover (Ascher et al., 1995). The present data indicate that the antidepressant-like activity of bupropion in the FST is due to its effects on the NE system. This suggests that bupropion's effects on the DA system alone may not be sufficient to mediate its antidepressant-like behavioral effects. The inability of the MAO inhibitor pargyline to produce antidepressant-like effects in Dbh−/−mice suggests that although pargyline increases extracellular levels of NE, serotonin, and dopamine (Taylor and Basbaum, 1995; Blaha et al., 1996; Singewald et al., 1999), its effects on NE neurotransmission probably contribute substantially to its antidepressant-like behavior. Furthermore, the lack of antidepressant-like action in Dbh−/− mice was not due to loss of MAO activity secondary to chronic absence of NE. The results from the studies with bupropion and pargyline indicate that enhancing dopaminergic and/or serotonergic signaling may not be sufficient to observe antidepressant-like effects in the mouse FST. This is interesting for two reasons. First, a reduction in dopaminergic signaling has been hypothesized to result in anhedonia, a core symptom of depression in humans (Rampello and Nicoletti, 2000). Second, many of the more recently developed antidepressants, such as the selective serotonin reuptake inhibitors, are thought to exert their therapeutic effects by increasing extracellular serotonin (Page et al., 1999). However, there are substantial limitations toward drawing parallels between animal models used to detect antidepressant-like activity and the idiopathic disease state in humans. For example, selective serotonin reuptake inhibitors such as fluoxetine do not reduce the immobility exhibited by most mouse strains in the FST (Lucki et al., 2001). Our preliminary results indicate that this is also the case for the 129/Sv × C57BL/6 hybrid mice used in this study (data not shown). The inability of the FST to detect enhanced serotonergic signaling in most mouse strains may play a role in the inability of pargyline to manifest antidepressant-like activity in the absence of NE in the current study. For mice with targeted gene disruptions, it is usually unclear whether a given phenotype is a result of loss of a specific protein or whether it is due to compensatory effects that the animal has adapted throughout development without the protein. Our experiments quantitating levels of NE transporter expression and MAO activity indicate that there are no compensatory changes in these measures that could explain the lack of a drug effect on behavior. Furthermore, we have not observed any changes in the pattern and density of adrenergic terminals following immunohistochemical visualization of NET in tissue sections throughout the neuraxis (S.-H. Jin and S. A. Thomas, unpublished observations). Additional experiments, such as assessment of NET kinetics, will be required to rule out the possibility that functional changes in NET have occurred in the absence of NE, however. Whether there are compensatory changes in other aspects of NE neurotransmission such as in adrenoceptor function, and/or in other neurotransmitter systems that are relevant to the antidepressant-like effects of the compounds tested, remains to be determined. The ability to restore NE with DOPS allows one to test for and potentially rule out developmental alterations as an etiology for phenotypic differences. DOPS pretreatment alone produced no effect in the FST in either genotype. Because DOPS was administered 5 h prior to behavioral testing, it is possible that theDbh−/− mice may have adapted to basal levels of extracellular NE with respect to their behavior in the FST. For comparison, a previous study showed that DOPS did not change immobility in intact mice, but it significantly reduced immobility time in mice pretreated with the selective NE neurotoxin DSP-4 (Semba and Takahashi, 1988). Although desipramine did not induce a significant anti-immobility effect in Dbh−/−animals compared with saline-treated animals, the immobility score was significantly lower compared with desipramine-treatedDbh−/− mice pretreated with vehicle, indicating at least a partial reversal of the phenotype. Furthermore, there was no significant difference in immobility scores between Dbh+/− andDbh−/− mice pretreated with DOPS and then given desipramine prior to the FST. 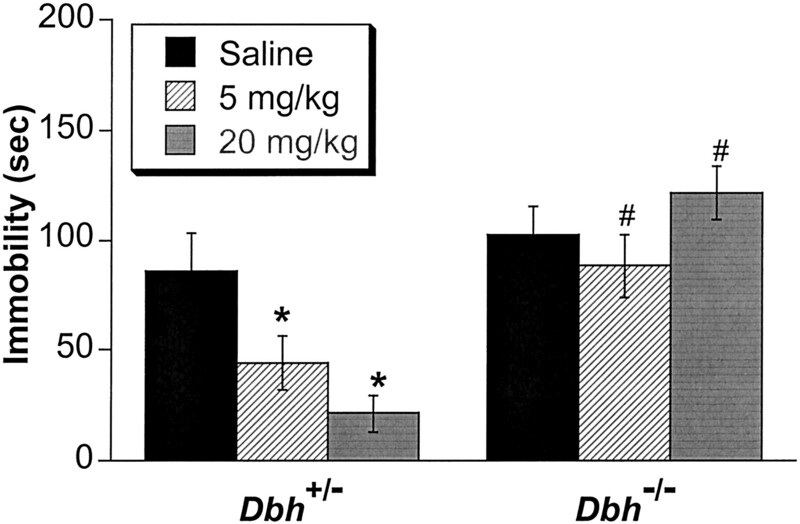 For reasons that are not clear, desipramine caused a significant increase in immobility inDbh−/− mice pretreated with saline. Increases in immobility were also observed, but to a lesser extent, in the first desipramine study, and also following administration of reboxetine, bupropion, and pargyline. Reasons for such increases are unclear but they parallel the increase in immobility seen following high doses of antidepressants in various strains of mice (Lucki et al., 2001). This exaggerated effect inDbh−/− mice pretreated with saline may explain why pretreatment with DOPS in theDbh−/− mice did not show a complete reversal of desipramine's effects. It seems likely that some of the reduction in immobility by desipramine following DOPS pretreatment is due to reversing the mechanisms responsible for the increase in immobility observed with desipramine following saline pretreatment. In conclusion, by using mice with a targeted disruption of theDbh gene, we have shown that NE is essential for the mediation of the antidepressant-like effects of desipramine, reboxetine, pargyline, and bupropion in the mouse FST. The inactivity of these compounds in Dbh−/−mice is not due to any alterations in the levels of NET immunoreactivity or in the activity of MAO. Furthermore, we have shown that replacing NE by administration of DOPS does not alter baseline performance in the test and at least partially reinstates the anti-immobility effects of desipramine in theDbh−/− mice. This confirms that mice lacking endogenous NE are a useful tool for dissecting the roles of NE in modulating stress and pharmacologically induced behavioral changes. It will be of interest to use this model in future studies where chronic administration of antidepressant drugs is required to elicit behavioral changes. Such tests may more closely mimic the mechanism of action of antidepressant drugs used in treating human depression. DOPS was provided as a generous gift by Sumitomo Pharmaceuticals. (Osaka, Japan). The rabbit polyclonal antibody to NET was graciously provided by Dr. Randy Blakely (Vanderbilt University, Nashville, TN). (1989) Partial injury to central noradrenergic neurons: reduction of tissue norepinephrine content is greater than reduction of extracellular norepinephrine measured by microdialysis. J Neurosci 9:4062–4067. (1995) Bupropion: a review of its mechanism of antidepressant activity. J Clin Psychiatry 56:395–401. (1990) DSP-4-induced depletion of brain norepinephrine produces opposite effects on exploratory behavior 3 and 14 days after treatment. Psychopharmacology 100:504–508. (1996) Does monoamine oxidase inhibition by pargyline increase extracellular dopamine concentrations in the striatum? Neuroscience 75:543–550. (1988) Is the forced swimming test a suitable model for revealing antidepressant activity? Psychopharmacology 94:147–160. (1995) Aggressive behavior and altered amounts of brain serotonin and norepinephrine in mice lacking MAOA. Science (Wash DC) 268:1763–1766. (1998) Monoamine dysfunction and the pathophysiology and treatment of depression. J Clin Psychiatry 59 (Suppl 14) 11–14. (1994) Evidence that the acute behavioral and electrophysiological effects of bupropion (Wellbutrin) are mediated by a noradrenergic mechanism. Neuropsychopharmacology 11:133–141. (1995) Differential in vivo regulation of mRNA encoding the norepinephrine transporter and tyrosine hydroxylase in rat adrenal medulla and locus ceruleus. J Neurochem 65:502–509. (1999) Murine models of depression. Psychopharmacology 147:14–16. (2000) Norepinephrine involvement in antidepressant action. J Clin Psychiatry 61 (Suppl 10) 25–30. (1991) Selective effects of DSP-4 on locus coeruleus axons: are there pharmacologically different types of noradrenergic axons in the central nervous system? Prog Brain Res 88:257–268. (1971) Depressions following reserpine: a reevaluation. Semin Psychiatry 3:435–448. (1998) A partial noradrenergic lesion induced by DSP-4 increases extracellular noradrenaline concentration in rat frontal cortex: a microdialysis study in vivo. Psychopharmacology 136:299–303. (2000) Effects of noradrenaline depletion in the brain on response on novelty in isolation-reared rats. Psychopharmacology 152:312–320. (1983) Recognition sites for norepinephrine uptake: regulation by neurotransmitter. Science (Wash DC) 220:626–629. (1997) The forced swimming test as a model for core and component behavioral effects of antidepressant drugs. Behav Pharmacol 8:523–532. (2001) Sensitivity to the effects of pharmacologically selective antidepressants in different strains of mice. Psychopharmacology 155:315–322. (2000) Noradrenergic lesions differentially alter the antidepressant-like effects of reboxetine. Soc Neurosci Abstr 26:1043. (1996) Clinical and biochemical effects of catecholamine depletion on antidepressant-induced remission of depression. Arch Gen Psychiatry 53:117–128. (1992) Effects of chronic bupropion on interstitial concentrations of dopamine in rat nucleus accumbens and striatum. Neuropsychopharmacology 7:7–14. (1999) Serotonergic mediation of the effects of fluoxetine, but not desipramine, in the rat forced swimming test. Psychopharmacology 147:162–167. (1977) Behavioural despair in mice: a primary screening test for antidepressants. Arch Int Pharmacodyn 229:327–336. (2000) Dopamine and depression –therapeutic implications. CNS Drugs 13:35–45. (1998) Dose-dependent noradrenergic and serotonergic properties of venlafaxine in animal models indicative of antidepressant activity. Psychopharmacology 138:1–8. (1965) The catecholamine hypothesis of affective disorders: a review of supporting evidence. Am J Psychiatry 122:509–522. (2000) Immunolocalization of the cocaine- and antidepressant-sensitive l-norepinephrine transporter. J Comp Neurol 420:211–232. (1988) Effect of monoamine precursors on the forced-swimming test in mice. Psychopharmacology 95:222–225. (1996) Involvement of the brain catecholaminergic system in the regulation of dominant behavior. Pharmacol Biochem Behav 53:285–290. (1999) Noradrenaline release in the locus coeruleus of conscious rats is triggered by drugs, stress and blood pressure changes. Neuroreport 10:1583–1587. (1995) Central noradrenergic neurones and stress. Pharmacol Ther 68:297–342. (1994) Effect of changes in swimming area on results of behavioral despair test. Pharmacol Biochem Behav 49:891–896. (1995) Neurochemical characterization of extracellular serotonin in the rostral ventromedial medulla and its modulation by noxious stimuli. J Neurochem 65:578–589. (1998) Restoration of norepinephrine and reversal of phenotypes in mice lacking dopamine beta-hydroxylase. J Neurochem 70:2468–2476. (1995) Noradrenaline is essential for mouse fetal development. Nature (Lond) 374:643–646. (1997a) Impaired maternal behavior in mice lacking norepinephrine and epinephrine. Cell 91:583–592. (1997b) Disruption of the dopamine beta-hydroxylase gene in mice suggests roles for norepinephrine in motor function, learning, and memory. Behav Neurosci 111:579–589. (1998) Activation of the locus ceruleus brain noradrenergic system during stress: circuitry, consequences, and regulation. Adv Pharmacol 42:781–784. (2000) Reboxetine a pharmacologically potent, selective, and specific norepinephrine reuptake inhibitor. Biol Psychiatry 47:818–829. (1993) Site-directed mutagenesis of monoamine oxidase A and B: role of cysteines. Mol Pharmacol 43:888–893.